Welcome to Brooklyn as we continue our Food Day Dinner Party! I was thrilled to be invited to host a side dish in this virtual, progressive dinner party to celebrate Food Day with my real friends (though we all met virtually): Bettina (The Lunch Tray), Bri (Red, Round or Green), Jeanne (The Jolly Tomato), and my Blog for Family Dinner colleague Kathleen Cuneo (Dinner Together). 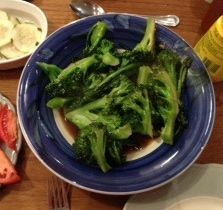 Today, Kathleen and I are hosting side dishes and together we are offering a Blog For Family Dinner T-shirt and the "Eat Real" Recipe booklet from Food Day as a prize. I've been pretty excited about Food Day, which was Monday, October 24. Our Blog for Family Dinner project marked it as the culmination day for our Month of Family Dinners and a couple of us were able to represent B4FD in Times Square. More importantly, I think that family dinner is a gateway to the broader benefits of eating good food, namely, eating better for yourself, your family, and the planet, as I have noted here. Laurie David's post Family Dinner and the Food Movement, which was on her site and Blog for Family Dinner on Monday also hits many important points about the interconnections. But enough about politics. This post is about the delicious benefits of real food and of sharing the table with friends and family. So far, this progressive dinner, first suggested by Brianne DeRosa of Red, Round, or Green, has featured a spinach salad appetizer from Bettina, lovely lamb chops and braised kale from Bri, and Kathleen is offering a side dish of sweet potatoes today on her blog. Please check out the amazing dishes and recipes. I love that we have all contributed dishes that have feature fresh vegetables: spinach salad, braised kale and sweet potatoes. The dishes, all unwittingly reinforce the statistic that families that cook and eat dinner together at home tend to eat more fruits and veggies! Parboil broccoli: Cook in boiling water for 3 minutes. Promptly remove and run under cold water, spin dry in a lettuce spinner, if you have one. Otherwise, pat with paper towels to remove excess water. Stir-Fry: Heat wok or saute pan until HOT. Add canola oil and quickly saute garlic for 10 seconds, careful not to burn it. Toss in dried broccoli, scraping up the bottom to mix garlic, oil and vegetable. Cook this way for maybe 1 minute. Lower heat and add soy sauce. Toss for another 30 to 1 minute and serve. 1. Wash the Broccoli well. Boil Water. 2. Finely Chop 2 cloves of Garlic. 3. Parboil Broccoli for 3 minutes. Spin Dry before stir-frying! 4. Heat Wok to HOT on High Heat. Add Canola Oil, quickly saute garlic for 10 seconds, being careful not to burn it. Stir-fry dried Broccoli, scrapping pan and tossing with garlic for 1 or 2 mins. Lower heat and add soy sauce. Toss and cook for approximately one more minute. 5. The Beautiful Broccoli with the Flavor! I hope you enjoy it. It is my youngest daughter's absolutely favorite thing to eat (it took a while to get there) but it's true. Add your own favorite real food recipe below or share any thoughts about Food Day, family dinner, or creative ways you get more vegetables onto your dinner table! You could win! The winner will randomly drawn from commenters on either this site or the Dinner Together site. Join us for a Food Day Dinner Party! Food Day is this Monday, October 24 and it's being touted as an Earth Day for food. There are over 2,000 events planned nationwide to celebrate real food and all the interconnections of real food, the food system, family, community, personal health and a healthier environment. It's a pretty exciting concept for anyone who, like me, cares about food, family, public health or public policy. How can you get involved? 2. Find a local event near you. I happen to be doing all three and I hope you'll join me in a virtual Food Day Dinner Party. Bri of Red, Round, Green has invited Bettina of The Lunch Tray, Jeanne of The Jolly Tomato and myself to join her in a virtual progressive dinner of real food recipes to celebrate Food Day over the week from 10.24 to 10.27. Monday will be our kick off with appetizers, followed by an entree on Tuesday, sides on Wednesday and dessert on Thursday. The whole idea is to keep thinking about and celebrating real food throughout the week, and maybe even the whole year! Come join us for our Dinner Party, starting at The Lunch Tray on Monday, 10.24. You can add your own recipe ideas or thoughts on family dinner or real food and be entered to win some fun give-aways. You can also host your own at-home dinner party and use the Food Day Dinner Kit (pdf) to spark discussion around the family dinner table. *If you are a food blogger and want to share a recipe or story about Food Day on your own site, please let me know. Add your name and link to the comment section below and I'll do a round-up on all the bloggers who are doing real food menus in honor of Food Day. Use the hashtags #FoodDay #DinnerParty to spread the word.